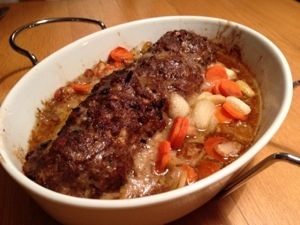 Yesterday Mathias made a fantastic meat loaf for dinner. He filled it with bacon and chanterelles and made homemade mashed potatoes. Yummy yummy! Yeah, surprisingly, meatloaf is actually really yummy. Mmmmmmm. Maybe that is what I”ll be cooking for dinner tonight. Thanks for the inspiration, Cecilia! I am curious, however, the recipes I have for meatloaf call for it to be baked, yet yours looks half poached, half baked. How do you cook yours? We baked it in the oven for an hour in 175 degrees (Celsius). Poured that yummy meat bouillon my hubby made all over the meat loaf, one time before he put it in the oven and the next time after 30 minutes in the oven. I can translate the recipe for you when I get home this weekend if you want.